Conductivity is suited to reactions that exhibit an ionic change and these may include metal ligand binding, micelle formation, proton exchange, ion exchange and reduction/oxidation reactions. 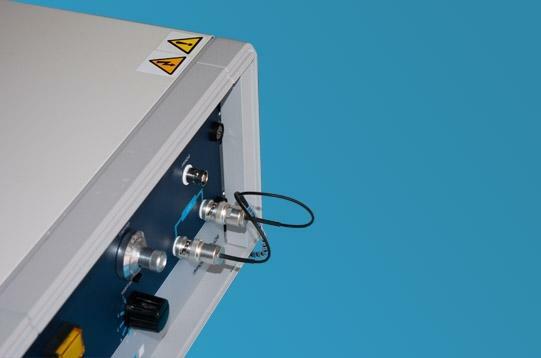 It comprises a conductivity mixing cell and accompanying conductivity meter. 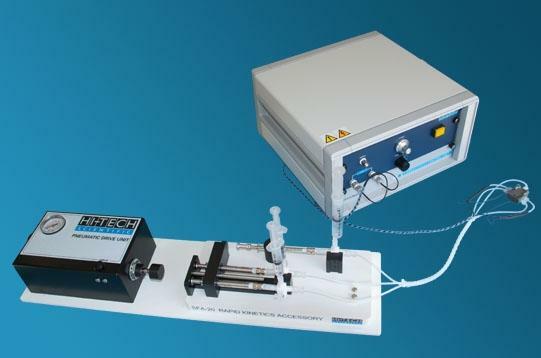 The mixing cell is installed on the sample handling unit with its associated electrode cables connecting it to the conductivity meter. This mixing cell is supplied in lieu of an optical cell for dedicated conductivity systems or an option for the user to change as required. The conductivity mixing cell has a T-format mixer and features a cylindrical cavity in a PEEK block. The ends are closed by platinum electrodes. The cell volume is 21 ul, with a nominal cell constant 4.24 cm-1. 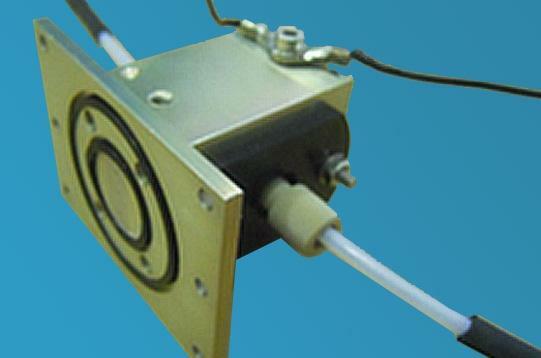 The precision machined and finished cell housing acts as an effective EMI/RFI shield. 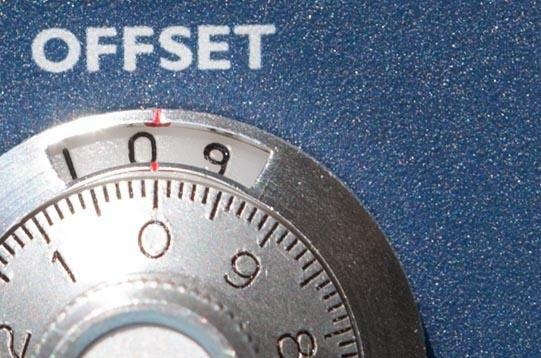 The interface to the sample handling unit makes the reagent connections easy and also connects the thermostat circuit thus enabling temperature control, with a 5-60 °C range. 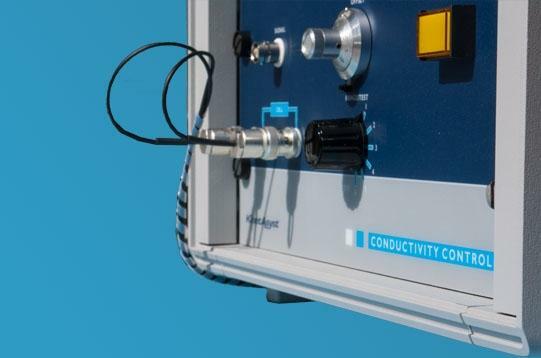 A conductivity meter provides the excitation signal and an output directly proportional to conductivity. This meter has six switched ranges allowing the user to measure conductivities from 5×10-6 S to 0.25 S.
The conductivity detection is supported within Kinetic Studio software enabling the user to report data in conductivity units. Kinetic Studio provides for data acquisition and analysis as well as full instrument control of the sample handling, operating in both single and double mixing modes. Ume, C.S., Ozturk, M.C. and Alper, E. (2012) Kinetics of CO2 Absorption by a Blended Aqueous Amine Solution. Chemical Engineering and Technology, 35, issue 3, pp. 464-468. Ume, C.S., Ozturk, M.C. and Alper, E. (2012) Reaction kinetics of carbon dioxide with 2-amino-2-hydroxymethyl-1,3-propanediol in aqueous solution obtained from the stopped flow method. Turk. J. Chem. 36, pp. 427-435. Ozturk, M.C., Ume, C.S. and Alper, E. (2012) Reaction Mechanism and Kinetics of 1,8- Diazabicyclo[5.4.0]undec-7-ene and Carbon Dioxide in Alkanol Solutions. Chemical Engineering and Technology, 35, issue 12, pp. 2093-2098. Rayer, A.V., Henni, A. and Li, J. (2012) Reaction kinetics of 2-((2-aminoethyl) amino) ethanol in aqueous and non-aqueous solutions using the stopped-flow technique. The Can. J. Chem. Eng doi: 10.1002/cjce.21690. (Early view – online version published before inclusion in an issue). Gordelisi, F.P. and Alper, E. (2011) The kinetics of carbon dioxide capture by solutions of piperazine and N-methyl piperazine. Int. J. Global Warming, 3, Nos.1/2, pp. 67-76. Streidl, N., Branzan, R. and Mayr, H. (2010), Nucleophilicities and Nucleofugalities of Organic Carbonates. Eur. J. Org. Chem., issue 22, pp. 4205-4210. Ali,S.H., Al-Rashed,O. and Merchant,S.Q. (2010) Opportunities for faster carbon dioxide removal: A kinetic study on the blending of methyl monoethanolamine and morpholine with 2-amino-2-methyl-1-propanol. Separation and Purification Technology, July 30, 74, issue 1, pp. 64-72.